A view of the deck of Carnival Triumph as a tugboat moves in behind the crippled cruise ship. 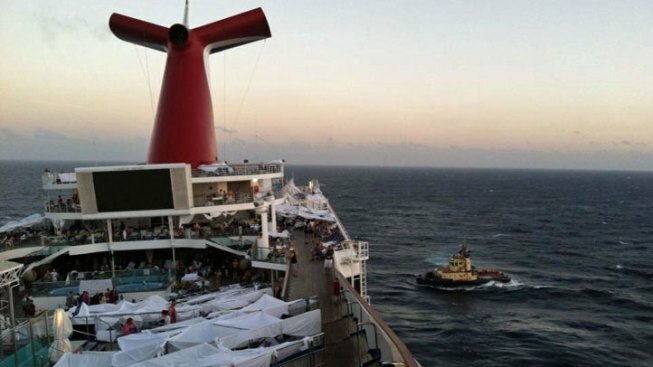 The 4,200 passengers who finally escaped the Carnival Triumph may be forgiven for never wanting to board another cruise ship again, after enduring days of raw sewage, relentless heat, and rotting food. And if you’ve been thinking about booking your own cruise, you may be having a few second thoughts of your own. The Centers for Disease Control and Prevention has a searchable tool which might help to calm your fears – or perhaps raise some new concerns. As part of its Vessel Sanitation Program, the CDC posts all of its cruise ship inspections, which you can search by cruise ship -- or by an entire cruise line. Click on Carnival in the “cruise lines” drop-down menu , for example, and you’ll find recent reports and scores for more than twenty of Carnival’s ships. You can also review an individual ship to find details of its most recent inspection – or inspections dating back several years. You can also use this search tool if you’re simply considering a cruise, to look for those ships which have the highest scores overall. The website even features a "Ship Scored 100" link which takes you directly to those ships with a “perfect” score. Or, if you’re so inclined, you can link directly to the ships that scored 85 or below, and read all about the ten ships listed there – including the cruise ship Amadea of the Phoenix Reissen Cruise Line, which currently possesses the CDC site’s lowest current overall score of 63.